Back in the 90s generation ñ burst to life with a credo decicated to everyone who “grew up with Santa Barbara & Captain Kirk, who went to Forrest and Casanovas, and went to ‘el Farrito’ with their families“. Someone must have slipped a copy of gen ñ to Yoani Sanchez in Cuba. She dedicates her popular generation Y blog to those born in Cuba in the 70s and 80s who grew up with “Russian Dolls, illegal defection, and frustration“, and she calls her blog ‘generation Y’ for all the Y names that popped up in that era. In fact, she shouts out to all the “Yanisleidi, Yoandri, Yusimí, Yuniesky”‘s out there. 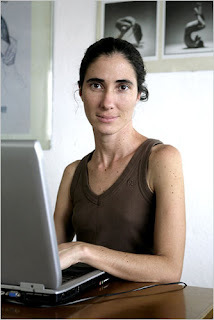 Last week the Cuban government tried to shut down her dissenting voice, and brought her site down. USA Today quotes the 32 year old student as saying “They are admitting that no alternative way of thinking can exist in Cuba, but people will continue reading us somehow,”. We’re sending you a shout fellow ñ, er… or rather, Y. What happens when you cross ñ and y anyway? It’ll be fun to find out. – A growing underground network of young people armed with computer memory sticks, digital cameras and clandestine Internet hookups has been mounting some challenges to the Cuban government in recent months, spreading news that the official state media try to suppress. Read it here. We’ve borrowed that pic from Jose Goitia, from the times. Nice to meet you Y.
Cachao – we thank you sir.